Hill Giants, otherwise called "Hillies" or "Giants", are very popular to kill for free-to-play players. This is mainly because they are very easy to kill and they have good drops for monsters of their level. Members can kill them for the same reason, but they can also kill Hill Giants for Slayer tasks. They are level-28. Their examination information is, "A very large foe." They hit slowly and use a crush attack. 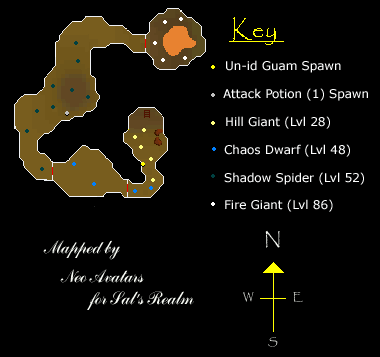 The major drops people want from Hill Giants are Big Bones, which you can bury for 15 Prayer experience or sell for a reasonable amount of money. You may find some low-leveled players running around, picking up drops from Hill Giants that the killers of the Hill Giants didn't pick up. This guide will inform you of everything you need to know about these monsters. There are six places to find Hill Giants. 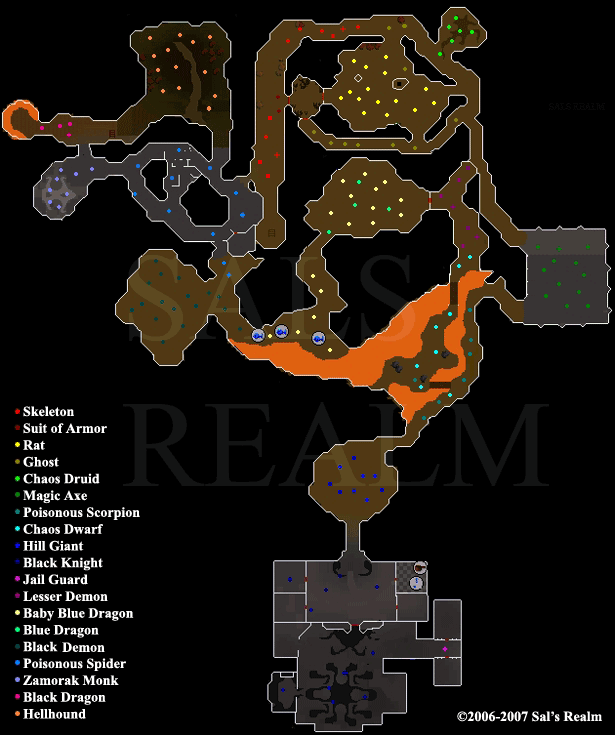 They are in the Varrock wilderness, in the Wilderness Fire Giant Dungeon, inside of the Tree Gnome Village, southwest of the Tree Gnome Stronghold, in the Taverley Dungeon, and in the Edgeville Dungeon. This Hill Giants spot in Varrock wilderness is not a great place to hunt them, since revenants are here, and it's far from a bank. It's located in level 16-19 wilderness. 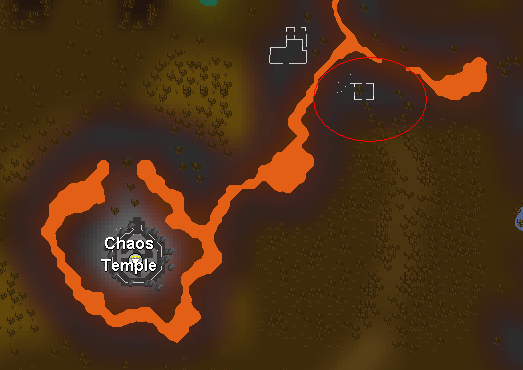 Another spot Hill Giants are located is in the Wilderness Fire Giant Dungeon. It is located in the deep wilderness, in level 52. It is only for members. 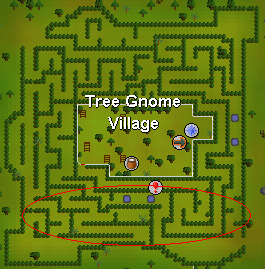 The spot inside of the Tree Gnome Village Maze isn't used much for killing Hill Giants. It is mostly near the bottom half of the maze. This spot is only for members. 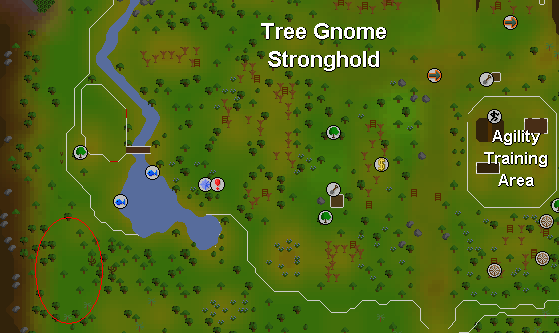 The spot southwest of the Tree Gnome Stronghold isn't used much either. It's very secluded and it is only for members. Another spot Hill Giants are located is in the Taverley dungeon, south of Taverley. There are many other higher-leveled monsters in the Taverley dungeon, so beware. This spot is only for members. 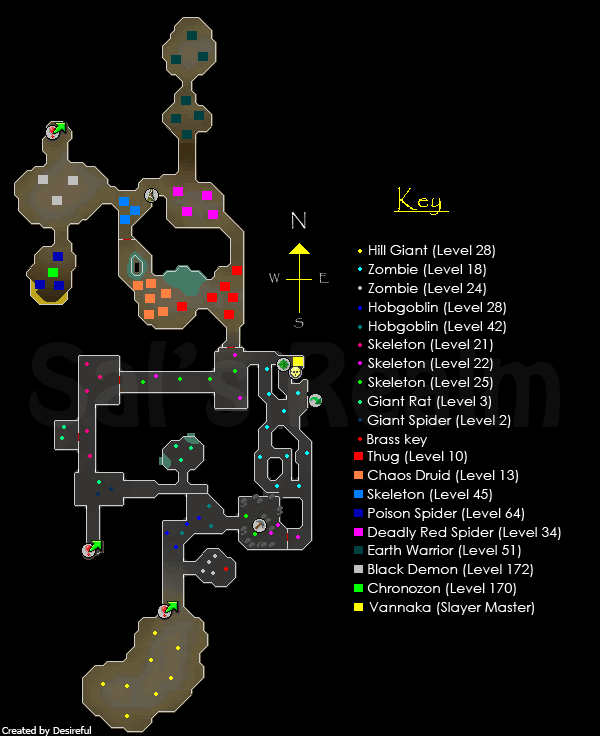 One of the most popular places people go to kill Hill Giants is in the Edgeville Dungeon. 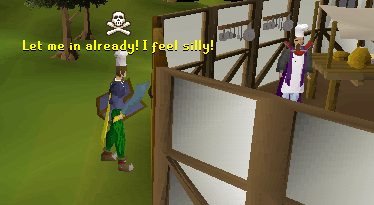 To get here, first go to Edgeville. In the building with the two Yew trees, there should be a trapdoor nearby, next to a coffin. Go down this ladder and follow the path to the room with a Brass Key respawn in it. That room is the room filled with level 24 Zombies to the south of the dungeon. 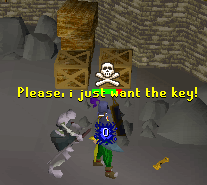 This key allows you to enter the Edgeville dungeon a different way, west of Varrock. This way is easier to get to the Hill Giants. When you go up the ladder, you should appear in a small hut, which you can only get in or out of by using the Brass Key with the door to unlock it. 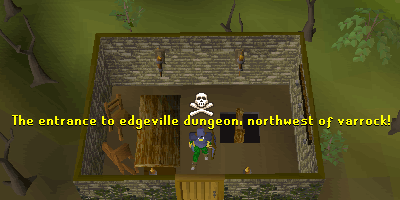 The northern half of the Edgeville Dungeon is members-only. 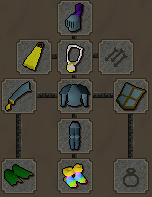 Before going to kill Hill Giants in the Edgeville Dungeon, you will probably need food, as Hill Giants can hit up to 90 Life Points on somebody with a low Defence level. 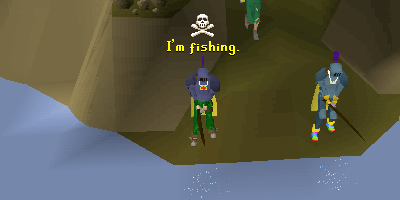 If you don't have food in your bank and you don't want to waste a lot of money on food later on, you can fish for food in Barbarian Village. You will need at least 20 Fishing and a Fly Fishing Rod and some Feathers. You can also use a regular Fishing Rod and Fishing Bait for other fish. Fly fishing is recommended though. This is because you can easily get feathers by killing Chickens in Lumbridge. 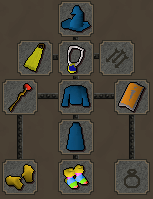 You can buy all of the gear you need for Fishing in Gerrant's Fishing Store located in Port Sarim too though. Trout require 20 Fishing to fish and Salmon require 30 Fishing. You don't need to fill up space in your inventory with a Tinderbox and Hatchet to cut the trees nearby and burn the logs received for a fire to cook the fish, because there is a fire in the Helmet Store, owned by Peksa, that never goes out. Another way is to make food in the Cooking Guild. You can cook things like Wine, which requires 35 cooking to make. Wine doesn't require you to bring anything, because the Cooking Guild already has Jugs, Grapes, and a water supply, which is all you need for making Wine. 32 Cooking and a Chef's Hat is required. 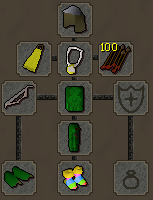 Players whose Combat level is 60 or higher shouldn't need food for fighting Hill Giants. Hill Giants are pretty easy to kill for most people, but they can't be killed by just everybody. They are level 28 so if that might be a challenge for you, you should at least meet most of these requirements or you'll be in danger. Melee: At least 30 Attack and Defence, and at least 40 Combat. Magic: At least 30 Magic. Ranging: At least 40 Ranging. Note: For Maging and Ranging, you can have any Magic or Ranging level you want because the recommended stats are for if you don't want to spend a long time trying to kill a Hill Giant. 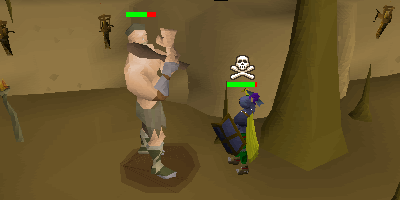 It doesn't matter what your Constitution, Defence, or Combat level is because you can mage/range the Hill Giants behind obstacles such as stalagmite and counters in places like the Edgeville Dungeon. For the Taverley dungeon, beware of higher-leveled monsters. You might need to be a higher level. Hill Giants use a crush attack, so try to wear something reasonably strong against crush attacks. The Ring of Wealth is for getting the better drops more commonly from the Hill Giants. Another way to kill Hill Giants is to use a Halberd. When a Hill Giant comes, attack it and run behind a counter or some stalagmite. It will follow you, trying to retaliate. When it comes near, start attacking it with your Halberd while it can't hurt you. 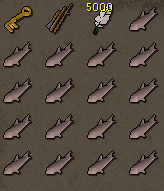 Big Bones can be buried for 15 prayer experience or they can be sold to players for around 300-500 gp each. Limpwurt Roots, along with Red Spiders' Eggs, can be made into a Strength Potion (3). You must give the Limpwurt Root and Red Spiders' eggs to the Apothecary near the west of Varrock along with 5 gp to make it. Limpwurt Roots can be sold for 200-500 gp to people who need to make Strength Potions. For more information on any items mentioned in this guide, please visit our Item Database.